Dehydrated strawberries make an attractive addition to your backpacking pantry because they can be rehydrated much faster than other fruits. On the trail, dehydrated strawberries make an excellent highlight ingredient to breakfast cereals both hot and cold. Thin slices re-hydrate quickly, and work well in instant oatmeal, particularly when added to the water before heating. 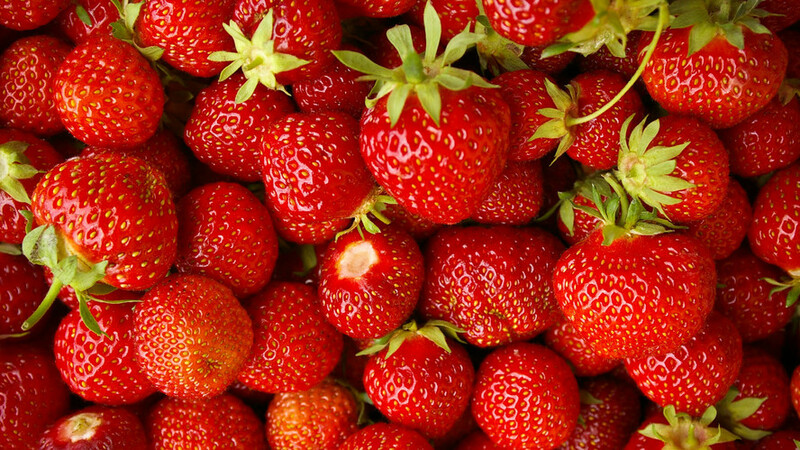 Strawberries are sweet and acidic enough that they do not require pre-treatment before dehydration. However, if they need to be stored for long periods outside of the refrigerator or freezer, a sulfite dip will help to slow oxidation. Rinse the strawberries under cool water. Remove the tops, and then chop into halves (or smaller slices for larger strawberries). Strawberries will drip juices when they are drying, and this can be avoided by placing the cut side facing up. Placing a solid plastic sheet at the base of the dehydrator to catch the drippings will make for easier clean-up. The cut sides of the drying strawberries can also stick to the plastic food dehydrator trays, so it is advisable to use food-safe nylon or polypropylene mesh to prevent sticking. Dehydrate the strawberries for about 8-10 hours. The berries will be fully dried when they are leathery, slightly pliable in the thick sections, and a little crunchy around the thin edges. Store dried strawberries in vacuum-sealed bags or Ziploc freezer bags in the refrigerator or freezer until you are ready to eat them.